Too many keys on your keyring? If you need master suite keys, we are here to help. Our expert locksmiths can help you protect your property from thieves. We can check locks, repair them, and can provide upgrades if your current locks need to be British Standards for example. 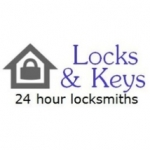 Our locksmiths have years of experience in this line of business and offer what the customer needs at a price that's right. We needed some locks done so we contacted Pete and the response was quick and effiefficient. The quality of work done was exceptional at competitive prices. We certainly would use this company again and woyld recomend to anyone. We called 4 other locksmiths and eventually called Locks and keys and spoke with Pete. He was the first locksmith willing to come out to us immediately. Within 10 minutes of him being here we were back in our house - no damage done to the door etc. We had spare keys inside and there was no need to change any locks. It was a fast resolution to a bad situation. We will be recommending Locks and keys to everyone. I had the need for a locksmith today and came across this company after calling a few other who were national call centres. Pete arrived within 45 minutes and unlocked the side door fairly effortlessly to get me back in to my house. I had to leave this review as it is a great relief to be back in the house and he gave me a great price and I was able to pay by card. It ended up being a pleasant experience - never thought I'd say that!